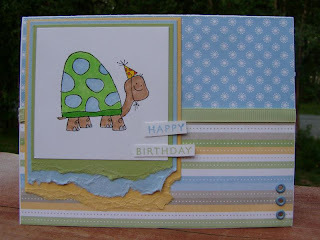 My friend Holly, of Inka Dinka Doodle , listed 'O' as the letter for Monday Stamps(formerly Sunday Stamps) this week. I had a few 'O' sets to choose from but went with 'Older And Wiser'. I cant believe I've never used this set before.It is so darn cute! You are right though. This little turtle guy is just adorable! I love the torn edges. Looks great! Such a happy card! Monday Stamps, just on Tuesday! Its Monday...you know what that means!